WINDOWS have often been likened to the eyes of a house, but they are something more than that to me. I never escape the feeling of the face behind the pane, and seldom of the soul shining out of the face. Show me the windows of a house and I will show you the manner of person dwelling inside. Walk the streets, drive along the country roads, do not the windows that you see, like the faces you meet, betray character back of them? Consider the perpetually drawn green shades of the farmhouse parlor. Do you not get the very atmosphere of the room, a room never opened to the sunlight, and but rarely opened to the visitor? Think of the cheap Nottingham-lace curtains, falling in straight folds from the curtain rod to the floor. You see them everywhere, - in the tenements of towns, and in small brick houses of country places and of outlying city streets. I am always suspicious of these, they serve so often as shields behind which a householder may peep at you unobserved. Now and then one of these curtains will part, giving you a vision of untidy children. And you know how pretentious the even cheap lace has been. Not half a block away there may be a hanging costing not a third as much, which, by a loop or a line, or some subtle touch, betokens refinement and order. And even in these better-appointed windows the materials of which the thin curtains are made are often too elaborate to be laundered, and are made, therefore, to last through a season. Toward spring those of many a prosperous person show heavy lines of dust just above the sash. The silk or satin of the drapery within may shed this dust, but muslin retains it. Who can deny, then, that it becomes easy to question the habits of the housekeeper who chooses a material that cannot be laundered, putting it in a window where the dust of the street is bound to reach it as it rises in the wind? In New York, where cleanliness is only purchased at the price of eternal vigilance, curtains next the window-panes must be washed frequently. I know one woman who has her thin parlor curtains changed sixteen times from November to May; but then, she always keeps her windows open a little from the top. There is never a neglected corner in her life. The nature of the inmates is also betrayed by the objects placed in a window. Once, as I rode in a trolley past a row of three or four story brick houses on a side street, I counted twelve windows in four blocks that had Nottingham lace curtains drawn just far enough apart to show a lamp in each. A light in a window may have a certain authority lent it by poetry and sentiment, but certainly not when the lamp is set on a pedestal and framed about by lace draperies. Of course I knew that those gaudy affairs, with their gorgeously decorated glass globes, just under those fluffy, inflammable curtains, were never meant to be lighted, else no fire department could have saved the city. Their owners had only desired to prove certain possessions to rival neighbors, like vain children who parade the streets to show off new umbrellas. 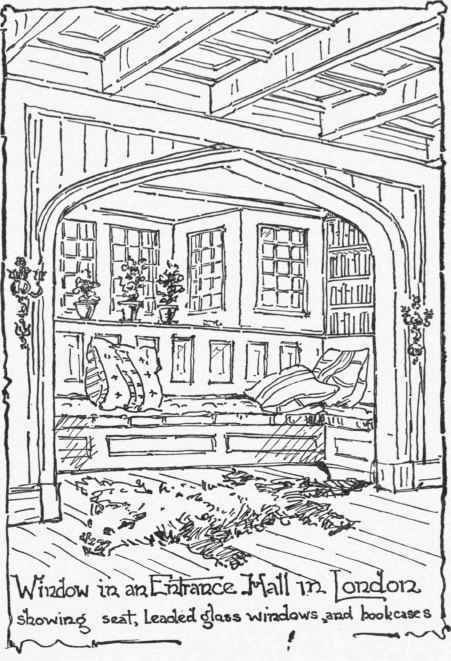 Growing plants in these windows would have indicated other sentiments, but lamps, cheap statuettes, and cut flowers in vases, placed in a window with curtains falling high behind them, arranged solely for the benefit of the passer-by, are intended only for display, and stamp the householder as one who knows nothing either of social requirements or the manner of living adopted by a polite world. And yet I maintain that the passer-by ought never to be altogether ignored in the arrangement of our windows. There was a woman in Boston who understood this. She had her window-boxes filled every spring, and her little plot of city yard planted with flowers. When she went away in summer she employed a gardener to keep these boxes and flowers in order, solely for the benefit of the people left behind in the streets, and obliged to pass daily miles and miles of closed windows and drawn blinds. Her action has always appealed to me. I believe that windows, like well-bred people, can protect themselves from intrusion without putting palpable affronts upon every one who approaches, and that they can do this while still being affable and graceful. One cheerful window, arranged with consideration for one's neighbors and the passers-by, will often relieve the tedium of a whole city block, and send the wayfarer on his way rejoicing. Opposite my dressmaker's there is a window of this kind. It is always flooded with sunshine. The panes are brightly polished, so that in the sunlight they serve of themselves as a protection. No muslin curtains hang against them; instead, brass jardinieres fill the sills, the ivies and the little palms in them having been trained high enough to act as a screen. Yet the idea of their being intended as a screen does not occur to you. You think of the plants, of their free, sunny life. At the same time, as you study them you realize that no haphazard touch has arranged them; that they have been placed there by an expert with skill and tact, producing an impression of undeniable charm. You catch sight of a pair of muslin curtains inside, and you know that in cases of necessity these curtains can be allowed to fall. You know, too, that there is a shade which can be drawn when the lamps are lighted. It is easy to see that people loving blue skies and sunlight live behind those panes; people preferring the out-of-doors, with its freshness, to stuffy effects indoors produced by windows trimmed with frills and furbelows like a lady's petticoat. 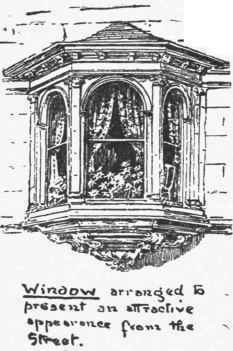 There are ever so many ways in which a window may be made to look well from the street and be given an individual and distinctive air. A note of red in one, a touch of yellow in another, a growing leaf against the pane, will accomplish much. You may get a note of color sometimes from an inside drapery; sometimes from a soft rich satin hanging, or again from a plant in bloom. They must be mere suggestions, however, else they become obtrusive, and obtrusiveness, especially where one's family life is concerned, is always vulgar. "In privacy," says Mr. Fuller, "there is a fine charm, a high distinction." But I sometimes believe that he is right when he adds, that among us, especially in certain parts of our country, "nothing is more public than privacy, nothing more ostentatious than reticence, nothing more calculated to draw the unfavorable notice of the community than any attempt at seclusion." For we take down all the fences in our country towns; we line our houses with front porches that become our summer drawing-rooms; inside our houses we sit with open doors. "What can I do to make my parlor look homelike?" some woman wrote me once. "When my husband and I come home from church on Sunday night we always stop on the pavement and look into our parlor. Everything seems so stiff, so back against the wall." No wonder, as I wrote her; perhaps even the chairs are trying to shrink out of the way of public gaze. Need I say that I urged her to begin her reform by pulling down her shades? She is not the only woman living in a small town who thinks it proper to permit the passing stranger a view of her parlor or her sitting-room, who would have all the world know that in her house, at least, there are no secrets to be hidden!